When is my painting finished? Before we answer the question, “Which paints to buy, so many to choose from?”, I thought we would tackle a more universal question all painters ultimately ask. Beginning students and established oil painters all face this same dilemma . Just when do you stop painting on your painting? Here are my top 6 recommendations of questions to ask yourself about your painting. Check your drawing for accuracy. Look at all the objects and make sure the drawing is as accurate as possible. Check that all buildings, and building elements like windows, doors, and roof lines have the correct “one or two-point perspective” lines and that everything is consistent. Perspective is one of those things that viewers notice immediately. Similar to facial relationships in portraits. Can you improve on the overall composition? Sometimes nature needs a bit of help to make the perfect painting composition. This is where your “artistic license” comes into play. Look for dull and drab large color areas that might be improved by adding additional shrubs, trees or rocks to break up the area. You don’t want a large area to look like it is one big piece of construction paper having the same color. The goal is to make every part of the painting interesting, not just the main focal point or area. Check your color values. We have covered this in a previous post, but it’s worth repeating. Make sure there are no pure colors, like red and yellow, in distant objects. Distant objects should be lighter and bluer and more blurred. Look at distant objects close to the sky and remember that this intersection should be close in values. Lighter mountains should be touching the lighter sky above. Looking at your focal point, do you have sharp contrast in values and color to draw the viewer’s attention. Usually your focal point/area is the place where the “darkest dark is next to the lightest light”. Monitor your edges, soften when in doubt. This goes back to values and not being a slave to copying your photo. Most beginner painters always paint the distant mountain range, or tree line way too dark. When you ask them why, the answer is always the same, “because that is what I see in the photo”. Yes, cameras are designed to increase contrast, but they are lying to us as painters. You can prove this to yourself by observing the same distant tree line against the sky from direct observation. Walk outside and really look at things receding in the distance. They do in fact get lighter, bluer and softer. Often the best thing you can do is take your Universal #6 round brush, your finger, and blur the edges between two objects to lower the contrast. Stop Early! It’s better to have a painting a little underdone, than overdone. More damage can be done in the last 5-10 minutes of a painting, by adding that “one last perfect thing”. Resist the urge and stop painting! Beginning artists often lay down one great powerful brush stroke, and then remove all that greatness by fussing with it after the fact. Jerry Yarnell, a great acrylic painting instructor on PBS television, calls it “licking the painting to death”. PS If you want to become a better painter & improve your skills as an artist, CLICK HERE. 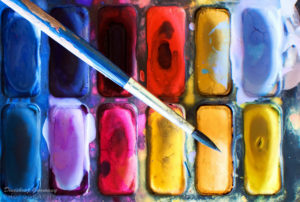 If you like these painting tips, please SHARE them with friends & LIKE us on Facebook! 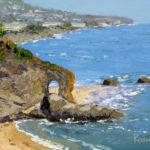 Michael Rodman – Oil Painter – Art Instructor. Your #1 painting question… answered. I’ve been teaching weekly painting parties for the past 4 years at local bars and restaurants. My weekly painting party philosophy is you should walk out with more painting skills than you walked in with. Yes, you bought a ticket to have a few drinks with your friends & have fun, but why not pick up some painting pointers along the way? Art classes are expensive and a huge investment of your precious time. So for the price of a happy hour meal with drinks, you learn how to be a better painter, one painting class at a time. Probably the most asked question in all my painting parties is, “How can I make my painting better?” This is a tough one to answer as every painting is different from the next. Some paintings need more small details and others need just to be signed. The overall goal is to make things look more three dimensional. Some paintings I see “were done 30 minutes ago”, and now they are in that “danger zone” of ruining the past 2 hours of effort. Knowing “when to stop painting” is a whole other topic, so let’s save that for a future discussion. Here are a few general tips on, “How to make your painting better”. Look for ways to increase contrast in your painting. Make the shadows a bit darker, especially in the foreground area. Look for ways to “add a highlight” on an object to indicate which side of the object is lit by the sun. Reduce any distant details in the background areas of your painting. Details only belong in the foreground, so blur things far away. Things get lighter and more blue in the distance. So no bright yellows or reds in the distance. The phrase “purple mountains Majesty” pretty much sums it up. Softer more muted colors belong in the distance. Look for areas to add a few “BOLD artistic strokes” and leave them alone. Beginning painters might add a great stroke to their canvas and then “lick it to death”. That means they try to “fix it”, when it looks great AS IS! Learn to stop before it’s done. As the artist, your job is to let the viewer participate in the viewing of the painting. If you paint everything in excruciating detail, then your painting looks more like a photograph. And this invites the viewer to look for flaws in your painting. My motto is, “Better to be underdone than overdone”. If you find this information helpful, please drop me a line and let me know what you think and what other questions you want answered. I answer all emails so feel free to share your thoughts at michael@vipartevents.com.